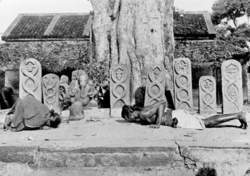 Worshipers praying in front of lingam, snake stones, and a figure of Ganesa in southern India, from Omens and Superstitions of Southern India by Edgar Thurston, 1912. Fortean Picture Library. It's a shame the words "critical" and "criticism" carry such negative baggage. Or it's a shame better words couldn't have been chosen to describe a method of scriptural study that has been around for hundreds of years, but became recognized as a science only in the nineteenth century. In this context, "criticism" doesn't mean "to criticize" in a negative sense, although that's exactly how many lay people interpret it when first confronted by the published results of biblical scholars. And to narrow the definition of literary criticism, or the historical critical method, to biblical research is a mistake as well. Any document can be subject to this method of analysis. But it is in the field of biblical research that literary criticism achieves perhaps its biggest popular audience. At face value, the idea behind the process is a simple one. It boils down to a single question: Is the Bible to be read like other books, or does it stand alone, above the field of human analysis? Until the pioneers of biblical criticism, Karl Heinrich Graf and Julius Wellhausen (it didn't help any that they were from Germany and lived just before World War I), suggested that the Bible could be studied just like any other work of literature, most people accepted without question that the Bible was in a class by itself and was to be read at face value. If the first five books of the Bible were attributed to Moses, then that's who wrote them. The books of Daniel and Isaiah each must have been written by the person whose name appeared at the top of the first page. If the book of Colossians bore Paul's name, than Paul wrote it. Throughout history, scholars have known better. Even the committees who put the Bible together (see Bible) used critical analysis to determine which books made the final cut. But the process was somehow, by universal consent, ignored by the vast majority of people who believed the Bible to be uniquely the work of God. If they acknowledged that too much human intervention occurred, it might detract from the power of God's word. Even today, many people are ignorant about how the Bible came to be, and they don't really want to know. But once scholars began to subject the Bible to the same methods of analysis used to examine other ancient texts, the secret leaked out. The process could not be stopped. And the academic discipline of literary or historical criticism was born. Its premise is, at root, that people wrote the Bible, not God. They may have been guided or inspired by God, but they were authors subject to the times and vocabulary in which they lived. Every scrap of evidence, including the words they used, other literature written at the same time, archaeological evidence, and literary techniques known to be prevalent in their day, must be studied to shed light on why the Bible is in the form it is. People who study such things are trying to discover the truth. People who don't are afraid scholars might undercut the uniqueness of the Bible. Since critical evidence is almost always subject to interpretation, the debate will no doubt continue. Like all sciences, there are conservative and liberal approaches. There can be no doubt that some findings have found almost universal acceptance. But in today's "publish or perish" environment, extravagant claims have been made to justify a new book and ensure for its author a reputation in the field of literary criticism. Let's examine an illustration to shed light on each of these two points of view: first, the traditional belief held by some that the author of one section of the Bible is the person who gives his name to that section; second, the biblical critical scholarship that points to evidence of multiple authors of that section, a view that finds wide, but certainly not universal, acceptance. The Pentateuch, the first five books of the Hebrew Bible, or what Christians refer to as the Old Testament, is, in many Bibles, referred to as the Books of Moses. That is because Moses has historically been credited with their composition. Of course there is a small problem with the final chapter of Deuteronomy, which describes Moses' death. But this minor problem is usually explained away by saying either that Moses prophesied his own death or that his aide de camp, Joshua, completed the final words of Moses' farewell speech. But by analyzing writing style and content, scholars began to detect layer upon layer of additions and "redactions," or editorial corrections. Literary fingerprints of many people began to appear. The Pentateuch seemed to be not so much a single blanket of one cloth, but a patchwork quilt sewn together by many hands. The oldest strand woven into this quilt is attributed to an author named "J," or "the Yahwist." "J" is the English transliteration of the German "Y." This author calls God by the name YHVH (often spelled Yahveh) or, in English, the Lord, or Jehovah. Although corroborating evidence is very technical, suffice it to say a consensus of scholars has come to believe "J" lived in Judah, the southern kingdom (see Judaism, Development of) sometime after the reign of King David. A second author refers to God by employing the name Elohim. This author is often referred to as "E," seems to be very appreciative of Moses, may have been a Levite priest, and probably lived a little later than "J," perhaps around 900-800 BCE. This is the author who wrote so much about Aaron (see Aaron), the first high priest, and the priesthood that followed him. The many pages of laws and rituals found in Leviticus and parts of Exodus come from the author known as "P," for "priestly source." He may have been the one who edited the work of "J" and "E," molding it into the present form we know today, while adding his own commentary from time to time. "P," for instance, gives us Genesis 1 and the story of creation in which God seems a bit aloof, building the universe step by step, "decently and in order," as a good priest goes about his work. "J" gives us Genesis 2, a different account that has God getting right down into the dirt to create Adam and Eve. It's interesting that "P" never once uses the Hebrew word for "mercy." "P" seems to have been a kind of two-thousand-year-old Puritan. The final author detected by literary criticism is the author named "D," the "Deuteronomist." This is the author of the book Deuteronomy, which seems to stand on its own, distinct in its own literary style. It purports to be the farewell address of Moses. Some see the hand of Jeremiah here. Others are not so sure. Some link Deuteronomy with the books of Joshua, Judges, 1 and 2 Samuel, and 1 and 2 Kings, forming a "Deuteronomistic history." Others don't buy it. Besides these four authors, some scholars think various editors, or redactors, were at work, molding the final product, even putting editorial "spins" on some stories to make them fit in with whatever interpretation was in vogue at the time of the redactor. For instance, if the redactor lived at the time of King David, it might be considered patriotic and "politically correct" to prepare the way for David's reign by shading Saul's reputation just a bit. After all, Saul was David's predecessor. Thus we have two conceptions of how the first five books of the Bible came to be. The first says Moses wrote it, working by himself. The second says the author was "JEPD," with perhaps "R," the redactor, contributing as well." And this is just an illustration from the Pentateuch. The whole Bible has undergone this kind of analysis and is subject to the same kind of academic debate. Biblical critical scholars take pains to point out that multiple authorship does not imply deceit. These authors were not trying to "put something over" on future generations, and there is no conspiracy going on. This was a perfectly normal practice of former times before the development of modern literary attitudes. Sometimes the authors wanted to humbly credit famous people. Sometimes they were simply doing what modern editors do today. Almost certainly none of them thought they were writing what would someday be considered scripture. They were just writing history as they saw it. The point is that critical scholarship, using proven textual analysis that has been applied to everything from Shakespeare to Aristotle, has perhaps discovered how the Bible came to be written. Their results do not necessarily eliminate God's inspiration, though their deductions could allow for a strictly human approach, free of any divine inspiration. Many academics have accepted their findings, and even very conservative scholars have concluded that at least some of their conclusions are probably true. But some scholars go further than even some liberal academics will accept. This happened when Harold Bloom and David Rosenberg published The Book of J, in which they concluded that the author "J" was a woman. The authors point out that "J" seems to have written a lot about women, unusual in a patriarchal society. She seems to cast women in a much lighter, almost playful, role than the other authors. Even more telling, "J" seems to have an easy and intimate knowledge of what the Bible calls "the manner of women," or menstruation. There is a wonderful story, for instance, in Genesis 31:30-35. Rachel, leaving home with her new husband, has stolen the household idols that she felt uncomfortable leaving behind. When her father begins searching for them, she eludes his search by placing them under the camel's saddle on which she is sitting and then tells her father she is having her period. He, of course, immediately backs off. Bloom and Rosenberg wonder: "Does this sound like the story a man would tell?" Even some feminist critics, however, backed away from the possibility that a woman in those patriarchal times could ever have been allowed to write a book of the Bible. The questions and observations raised by Bloom and Rosenberg were good ones. But there is simply not enough evidence to convince the academic jury. Another literary discipline that has captured a lot of ink in the public press is the concept of "demythologizing." To understand the principle, let's begin with a wellknown myth. Every Christmas, Santa Claus flies down from the North Pole to deliver presents to all the good little boys and girls of the world. We all know the myth, embellished with reindeer and sleighs and elves and all. Only the very young among us accept the story as history. But no one who tells the story, not the television producer or the newspaper editor, begins with a disclaimer. When you go to a movie theater to see the latest incarnation of Tim Allen's The Santa Clause, there is no opening statement: "Warning! This is not a true story. In no way is it to be taken as historical fact!" We just know the myth and accept it as that. We don't have to belabor the point. But suppose a culture existing two thousand years from now digs up a copy of Rudolph, the Red-Nosed Reindeer? At face value, they will have to assume the book is telling a historically true story because nowhere does the book claim to be anything different from that. Some future readers are going to choose to believe the story actually happened. They might even invent a "Santa Claus" religion. Others will probably try to demythologize the story. In other words, they will try to get at the meaning of the myth after the fantasy is removed. They will decide that reindeer, for instance, can't really fly. They will produce statistical tables proving the improbability of one person getting to two billion homes in one evening. They will point out that not all homes even had chimneys. The point is that after they remove the obvious embellishments, they will still be faced with a historical fact. Their archaeologists, after having discovered much evidence of Christmas trees and presents, will have to deduce that children did get Christmas presents on Christmas Eve in various locations around the world. So after demythologizing the story, they will be forced to decide that Santa Claus was a way to explain historical reality, buried under layers of myth. Christmas actually and historically happened in a way that the myth portrayed as metaphor. Will they still believe in Christmas? Absolutely. But will they believe it actually happened in the way the stories say it happened? Probably not. And unless some of us actually write down how we have fun with the story, and our future friends discover our writing, they will probably assume we were just primitive people who didn't know any better. Here's the point. A lot happens in the Bible that is, shall we say, out of the ordinary. Jesus walks on the sea and changes water into wine. People are brought back from the dead. The Red Sea parts. Moses talks to a burning bush. Did these things really happen? Or are they myths encapsulating historical truth? Is there a kernel of history at the heart of these myths? If so, what is more important—the story or the truth the story is trying convey? Demythologizing is not an attempt to "disprove" the Bible. It is an attempt to recapture what the original author meant to convey within the context of his (or her) times. These examples illustrate that critical scholarship is not, as detractors claim, some liberal conspiracy to destroy religion. It is a serious science that, like any other science, has to convince a majority of colleagues before it stands the test of time. Some conclusions pass the cut. Others do not. Wild assumptions may sell books, but it takes quite a persuasive piece of disciplined scholarship to become "gospel truth." But the Bible is different from other works of literature in that most Shakespeare lovers don't really care if someone other than the Bard wrote his works. But Bible believers do care if the Bible is portrayed as simply another piece of literature written in ancient times. As long as those feelings are present, critical scholarship will continue to be a disputed academic discipline. (literaturnaia kritika), the evaluation and interpretation of literary works; the exposure and affirmation of the creative principles of a given literary movement; a form of literary creativity. Literary criticism proceeds from the general methodology of the study of literature (literaturovedenie) and bases itself on the history of literature. In contrast to literary history, criticism deals primarily with contemporary literary movements and interprets the classical heritage from the viewpoint of contemporary social and artistic concerns. Literary criticism is as closely related to an era’s life and social struggle as it is to its philosophical and aesthetic ideas. The word “criticism” derives from the Greek kritike, the art of analyzing and judging. Critical judgments about literature arose almost simultaneously with literature itself, originally as the opinion of the most respected and learned readers. Already a professional pursuit in classical Greece and Rome and ancient India and China, literary criticism nevertheless was long considered an “applied” form of writing in comparison with the other creative genres, intended only as an overall evaluation of a work, as encouragement or discouragement of an author, and as a recommendation to other readers. The theoretical definition of literary criticism must be approached historically. For example, in the 17th and 18th centuries, in accordance with neoclassical aesthetics, criticism demanded only a dispassionate evaluation of a work, based on common sense, with some indication of individual “faults” and “beauties.” In the 19th century criticism evolved into a special genre of literature, and a writer was considered in relation to his times and to society. The history of literary criticism in the West, which is closely related to the history of literary schools and movements and the development of literary scholarship, directly or indirectly expresses the social relationships and contradictions of its time. The most significant Western critics and writers advanced programs for the development of literature and formulated social and aesthetic principles (for example, Diderot and Lessing as early as the 18th century and de Staël, Heine, Hugo, and Zola in the 19th). In the first half of the 19th century, criticism in Europe won a place for itself as a literary profession. Critics who were influential in their time included C. A. Sainte-Beuve, H. Taine, and F. Brunetière (France), M. Arnold (England), and G. Brandes (Denmark). In the USA, the most notable achievements of literary criticism belong to the first half of the 20th century and are associated with the names of V. L. Parrington and Van Wyck Brooks. In Russia the first literary critics were writers of the mid-18th century: M. V. Lomonosov, A. D. Kantemir, and V. K. Tredia-kovskii. The range and possibilities of criticism were expanded by N. M. Karamzin, who first lent it a social character. The Decembrist critics (A. A. Bestuzhev and others), proceeding from a revolutionary-romantic standpoint, upheld the idea of the narodnost’ (the reflection of the people’s ideals and desires, by the art) and uniqueness of Russian literature. N. I. Nadezhdin, in many ways the predecessor of V. G. Belinskii, approached a recognition of the principles of realistic criticism. The first high models of Russian literary criticism appeared in the critical prose of A. S. Pushkin and N. V. Gogol, who made subtle judgments about the purposes of literature, realism, and satire and the nature and aims of literary criticism. In the criticism of V. G. Belinskii, who advanced the concept of critical realism, the evaluation of a work was based on its interpretation as an artistic whole, in the unity of its ideas and images; the writer’s work was viewed in relation to the history of literature and society. Not satisfied with evaluating a work in the light of its author’s concept, N. G. Chernyshevskii and N. A. Dobroliubov made the main task of literary criticism the evaluation of life itself with its processes and social types, based on the truthful testimony of the artist as revealed in his work. The fundamental innovation of their approach, which expanded the very concept of criticism, lay in interpreting a realistic work in a way that would reveal the genuine depth of its true-to-life content. The revolutionary-democratic critics of the 1860’s and 1870’s (such as Chernyshevskii, Dobroliubov, D. I. Pisarev, and M. E. Saltykov-Shchedrin), who continued the traditions of Belinskii, succeeded in blending literary activity with ardent protests against serfdom and autocracy and with calls for the freedom of the people. Their work was forged in the ideological and literary struggle with the liberal tendencies of “aesthetic criticism” (represented by A. V. Druzhinin, V. P. Botkin, and others), which attempted to sever art and literature from social life. They also struggled with the nonsocial interpretation of literature’s narodnost’, found in the criticism of the pochvenniki (“grassroots movement,” exemplified by A. A. Grigor’ev and N. N. Strakhov). Many works by the aestheticians and pochvenniki possessed undoubted virtues and gave a worthwhile analysis of individual literary works, but on the whole they represented a negation of the progressive movement of the Russian revolutionary-democratic critics. A new, genuinely scientific methodological basis for literary criticism was provided by K. Marx and F. Engels in their teachings revealing the fundamental laws of sociohistorical development and in their statements on questions of art and literature. Marxist criticism in the West, which arose in the second half of the 19th century, was represented by such outstanding men of letters as F. Mehring (Germany) and P. Lafargue (France), who were the first to treat the problems of art from the standpoint of historical materialism. A new stage in the development of Russian critical thought was begun by Marxist criticism, which in the late 19th and early 20th centuries took over and developed the best traditions of revolutionary-democratic criticism; it was forged in the struggle with populist literary criticism (represented by N. K. Mikhailov-skii) and decadent criticism (A. Volynskii). The works of G. V. Plekhanov both set forth and carried through the principle of the historical-materialist approach to literature and its evaluation from a class standpoint. The articles and speeches of V. I. Lenin were incalculably important in the development of Marxist literary criticism. In a cycle of articles on L. N. Tolstoy, Lenin expounded the “theory of reflection” as it applied to literary creation. Lenin’s principle of literature’s partiinost’, or party-mindedness (which he advanced in the article “Party Organization and Party Literature,” 1905), his attitude toward cultural heritage, and his defense of the realistic traditions of classical literature greatly influenced the formation of Marxist literary criticism in Russia. Its development is associated with such names as V. V. Vorovskii, A. V. Lunacharskii, and M. Gorky. Lenin’s works were a cornerstone of the methodological basis of Soviet literary scholarship and criticism. After the October Revolution of 1917 in Russia and particularly as a result of the mid-century growth of the socialist camp, Marxist literary scholarship and criticism became a leading international movement; it is represented by the total body of criticism in socialist countries and by many Marxist critics in the bourgeois states of the West and East—for example, R. Fox and C. Caudwell. Marxist criticism examines a literary work in all its aspects and qualities from a viewpoint combining sociology, aesthetics, and ethics. Literary criticism, like literary creation itself, is a means for both perceiving and acting upon life, and like literature can be part of the humanities, “the study of man.” Thus criticism must live up to its lofty responsibilities as a medium of ideological and aesthetic education. Criticism points out the virtues and failings of a work to the writer, thus helping him broaden his intellectual horizons and improve his technical mastery. Addressing himself to the reader, the critic not only elucidates the work for him but also actively engages the reader in the mutual apprehension of the work on a new level of understanding. A critic must be able to view a work as an artistic whole and to place it in the perspective of literary development. Modern literary criticism is written in a variety of genres, including the article, review, survey, essay, literary profile, polemical statement, and bibliographical annotation. In any genre, the critic must be, in a sense, a political thinker, sociologist, and psychologist, as well as a literary historian and aesthetician. The critic must also possess a talent that is similar, but not identical, to the talents of both artists and scholars. In Soviet criticism the partiinost’ of critical pronouncements and the soundness of the critic’s Marxist-Leninist education are growing in importance. The Soviet critic is guided by socialist realism—the basic creative method of all Soviet literature. The Central Committee of the CPSU in its resolution On Criticism of Literature and Art (1972) noted that it is the critic’s obligation, while profoundly analyzing the laws of the modern artistic process, to contribute in every way to the strengthening of the Leninist principles of partiinost’ and narodnost’, to struggle for a high ideological and aesthetic level in Soviet art, and to consistently combat bourgeois ideology. Soviet literary criticism, in alliance with the criticism of the other fraternal socialist countries and Marxist literary criticism in the capitalist countries, takes an active part in the international ideological struggle and combats the bourgeois aesthetic formalist conceptions that attempt to exclude literature from the life of society and to cultivate an elitist art for the few. Soviet literary criticism also combats the revisionist concept of “realism without shores” (represented by R. Garaudy and E. Fischer), which calls for peaceful ideological coexistence, that is to say, capitulation of the realistic schools to bourgeois modernism. Finally, Soviet criticism combats leftist-nihilistic attempts to “liquidate” cultural heritage and do away with the cognitive value of realistic literature. In the second half of the 20th century, the progressive press of many countries has been surveying with greater endeavor V. I. Lenin’s views on literature. One of the pressing issues of contemporary literary criticism is its attitude to the literature of socialist realism. In foreign criticism this method has both its defenders and its implacable foes. The pronouncements of the “Sovietologists” (such as G. Struve, G. Ermolaev, M. Hayward, and J. Rülle) on the literature of socialist realism are directed not only against an artistic method but, essentially, against the social relationships and ideas that determined its genesis and development. Such writers as M. Gorky and A. Fadeev have explained and defended the principles of socialist realism in Soviet criticism. Soviet literary criticism, carrying on an active struggle for the affirmation of socialist realism in literature, is called upon to combine precise ideological evaluations and profound social analysis with aesthetic exactingness and a nurturing attitude toward talent and fruitful creative experimentation. Convincing literary criticism can influence the course of literary development and the entire literary process by consistently supporting progressive tendencies and rejecting alien ones. Marxist criticism, founded on scientific techniques of objective research and on the vital interests of society, stands in opposition to impressionistic, subjectivist criticism, which considers itself free from consistent concepts, a holistic vision, and a conscious point of view. Soviet criticism carries on a struggle with dogmatic criticism, which, based as it is on a priori judgments about art, cannot recognize the very essence of art and its poetic concept, characters, and conflicts. In the struggle with subjectivism and dogmatism, criticism that is social in nature, scientific and creative in method, analytical in investigative techniques, and in tune with the broad reading public is the one that will prevail. Criticism’s responsibility in the literary process and the fate of both book and author raises the question of its moral obligations. The profession imposes weighty moral obligations on the critic and presupposes fundamental honesty in his argumentation, as well as understanding and tact in his attitude to the writer. Distortions, capricious quotations, “labeling,” and unfounded deductions are incompatible with the very essence of literary criticism. Outspoken and rigorous judgments of pulp literature are qualities that have been innate to progressive Russian criticism since Belinskii’s time. As the Central Committee of the CPSU pointed out in its resolution On Criticism of Literature and Art, there should be no place in criticism for a conciliatory attitude toward ideological and artistic rubbish, subjectivism, and group or “buddy” partiality. Articles or reviews should never “be one-sided, contain unjustified compliments, amount to a hasty summary of a work’s contents, or fail to convey its real importance and value” (Pravda, Jan. 25, 1972, p. 1). Scientifically convincing arguments in conjunction with partiinost ’-oriented judgments, ideological commitment, and impeccable artistic taste are the basis for the moral authority of Soviet literary criticism and its influence on literature. Belinskii, V. G. “Rech’ o kritike.” Poln. sobr. soch., vol. 6. Moscow, 1955. Lunacharskii, A. V. Kritika i kritiki: Sbornik statei. Moscow, 1938. Lunacharskii, A. V. “Lenin i literaturovedenie.” Sobr. soch., vol. 8. Moscow, 1967. Ocherki po istorii russkoi zhurnalistiki i kritiki, vols. 1–2. Moscow, 1950— 65. Riurikov, B. S. “Osnovnye problemy sovetskoi literaturnoi kritiki.” In Vtoroi Vsesoiuznyi s”ezd sovetskikh pisatelei. Moscow, 1956. Fadeev, A. “Zadachi literaturnoi teorii i kritiki.” In his collection Za tridtsat’ let. Moscow, 1957. Belinskii i sovremennost’. Moscow, 1964. Ocherki istorii russkoi sovetskoi zhurnalistiki, vol. 1, 1917–32, Moscow, 1966. Vol. 2, 1933–45: Moscow, 1968. “Aktual’nye problemy kritiki i literaturovedeniia.” Voprosy literatury, 1966, no. 6. Kuleshov, V. I. Istoriia russkoi kritiki. Moscow, 1972. Bursov, B. “Kritika kak literatura.” Zvezda, 1973, nos. 6–8. Veiman, R. “Novaia kritika” i razvitie burzhuaznogo literaturovedeniia. Moscow, 1965. Formirovanie marksistskoi literaturnoi kritiki v zarubezhnykh slavianskikh stranakh. Moscow, 1972. “Zadachi i vozmozhnosti literaturnoi kritiki (Na mezhdunarodnom kongresse v Reimse).” Inostrannaia literatura, 1972, no. 9. Teeter, L. “Scholarship and the Art of Criticism.” A Journal of English Literary History, 1938, no. 5. Peyre, H. Writers and Their Critics. Ithaca, 1944. Wright, however, was an active member of the Communist Party throughout the 1930s, (3) and he served as head of the Chicago branch of the literary John Reed Club, published pieces in Party-sponsored and Party-friendly magazines like New Masses and Partisan Review, and rose to prominence as a poet, short story writer, literary critic, and journalist. A good literary critic is not a political ideologue or policy wonk. Borrowing the concept from anthropology, literary critics often employ a "simplified, distorted, or undertheorized version" of it, with the vagueness quite possibly only enhancing its "tremendous authority" in the field. Storey contends that literary critics need to "take seriously the implications of human evolution" for their field. His book should interest those historians for whom literary texts of the Reformation are useful evidence as well as those literary critics interested in the rhetoric of religion or the creation of reformation "texts" both written and executed. It's hard to think of contemporary literary critics who do such work now. Like most literary critics, he assumes the unity of the piece that he examines. Though Battersby makes powerful use of Anglo-American analytic philosophy to support his overall position, I suspect that the book may have little influence on literary critics and theorists. In addition to having the opportunity to meet and mingle with attending PEN members -- including well-known authors, editors, and literary critics -- the winning writer will gain exposure to millions of book-loving readers when the winning manuscript is published online at Amazon. He examines the debate among contemporaries, literary critics, academic historians, and Burns over the nature and contribution of his work to history, as well as how he characterized America's western mythological figures and analyzed them in the context of events and influences in his own life. This feeling among literary critics survives to this day.